In the fall of 2014, the Australian Department of Defence asked the RAND Corporation to assess the economic consequences of shipbuilding. This tasking was part of a larger project on the Australian naval industrial base examining whether Australia should import ships from foreign manufacturers or build them in Australia. As part of RAND’s inquiry, we conducted case studies of the economic impact of Newport News Shipbuilding (NNS) in Newport News, Virginia and Austal USA shipbuilding in Mobile, Alabama. Our insights are drawn from interviews with subject-matter experts (both employed by and unaffiliated with the shipbuilders), as well as an analysis of publicly available – e.g., government, corporate annual report – data concerning both firms. Concurrently, we reviewed the extensive literature on economic multipliers. Commonly used economic multiplier software packages include the Regional Input-Output Modeling System (RIMS) and Impact Analysis for Planning (IMPLAN). Though widely used, we were struck by the relative lack of value of economic multiplier estimates. Most centrally, estimated economic multipliers do not lend themselves to the seemingly desirable usage: Just because one has estimated a multiplier of, say, 2.0, it does not logically follow that a $100 million new project would have a $200 million net impact on its community. The net impact could be greater than $200 million or, perhaps more likely, less than $200 million. But, in fact, the actual impact is so context-dependent that we fundamentally question the value of economic multiplier estimates. Here we provide an overview of economic multipliers, how they work, and what they assume. We then discuss what we observed at NNS and Austal USA. Both shipbuilders, we find, have had favorable economic impacts on their regions; in particular, demonstrably improving the lives of their blue collar workers. However, we concluded that estimated multipliers do not appear to be especially informative as to shipbuilders’ economic impact. There is an extensive literature on economic multipliers, but we were surprised by its lack of consensus or clarity. The economic impact of a given project varies with the economic conditions and specific context in which the shipbuilding spending would occur. An economic multiplier is a foundational concept in macroeconomics. Suppose that the government spends $100 buying a good or service from a company or individual. The party that receives the $100 might then be expected to spend the $100 (or at least a portion of it) on some other goods and services. The original $100 creates a cascade (i.e., multiples) of spending through the economy: it results in additional spending by shipbuilder workers at local restaurants, which then hire additional workers who rent additional housing, and so forth. The cascade of resultant spending is not going to be infinite, because recipients at each stage may save some of the money, will have to pay taxes on it, and may spend some of the money outside the measured region. If a leakage (saving, taxation, imports) rate can be estimated, the economic multiplier represents the sum of a convergent geometric series. For example, with a leakage rate of 50 percent, the original $100 in spending would result in a total regionwide spending increase of $200 ($100 plus $50 plus $25 plus $12.50 plus $6.25, and so on), or an economic multiplier of 2.0. Note that multiplier values in this formulation include the original level of spending. Multipliers are estimated using input-output modeling, which includes RIMS and IMPLAN previously mentioned. This approach establishes different categories of expenditures, and it is estimated where a dollar, if spent in a category, is subsequently spent across other categories. The calculations are essentially a bookkeeping-type exercise. A dollar sent to a recipient (e.g., a shipbuilder) is divided between categories of usage (e.g., a share to pay workers, a share to purchase materials from subcontractors, a share paid in dividends to shareholders, a share paid in taxes), and then each category, in turn, has its own allocation of consequent spending. An example from the Second World War illustrates why we cannot simply multiply an estimated multiplier by a new project’s size to estimate the new project’s impact. The vast defense-related buildup that the United States’ manufacturing base undertook came at the expense of the production of consumer products. Herman (2012, p. 153) notes: First came the auto industry, with a drastic cut by more than half. Then in October  nonessential construction was ordered halted, to divert materials to defense plant construction. On October 21 manufacturers had to stop using copper in almost all civilian products, followed by sharp cuts in refrigerators, vacuum cleaners, metal office furniture, and similar durable goods. The total amount of economic activity generated by U.S. manufacturers did not increase by the magnitude of their government defense contracts. Rather, the net change was the value of those contracts less the value of the consumer products that would have been manufactured absent the government contracts. When we consider displacement or crowding out effects, we find that economic impacts can be considerably less than those estimated by RIMS or IMPLAN. Economic multiplier estimates implicitly assume that all new positions absorb previously unemployed workers rather than drawing workers away from other employers. If, ultimately, the new project simply displaces comparable projects, the economic impact would be zero. We have to ask, then, what activities are displaced by the government’s shipbuilding contract. The higher the economic value of the displaced activity, the lower the net economic impact of the shipbuilding contract would be. On the other hand, to the extent that shipbuilding reduces unemployment or underemployment, a larger impact is implied. It is also possible that estimated economic multipliers understate long-run economic impact. What were shipbuilder workers doing before they were hired by the shipbuilder? What might they plausibly be doing if not employed by the shipbuilder? Has the shipbuilder generated spin-off firms undertaking nonnautical or nondefense business? If such a phenomenon were widespread, it would suggest that the economic impact of shipbuilding is understated by economic multiplier arithmetic. Let us first look at NNS. NNS, a division of Huntington Ingalls Industries, is the largest shipbuilding company in the United States. Founded in 1886, NNS is the largest industrial employer in the Commonwealth of Virginia. NNS has built more than 800 naval and commercial ships; though, since the end of the 1990s, NNS has exclusively built ships for the U.S. Navy. NNS is the United States’ sole designer, builder, and refueler of nuclear-powered aircraft carriers, as well as one of two shipbuilders (the other being Electric Boat in Groton, Connecticut) with the capability to design and build nuclear-powered submarines. NNS built the world’s first nuclear-powered aircraft carrier, the USS Enterprise; all ten of the Nimitz-class nuclear aircraft carriers; and is currently building the Ford-class nuclear aircraft carriers and Virginia-class nuclear-powered submarines. USASpending.gov suggests that NNS has received obligations of roughly $3 billion per year from the U.S. government. But not all of these obligations were spent in the region; NNS has a network of suppliers throughout the United States. NNS is located on a 550-acre site in Newport News, a city with about 182,000 residents. The city runs on a northwest-to-southeast angle along the James River waterfront; NNS is located at the southern end of the city. 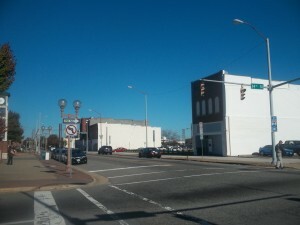 The city of Newport News is part of the Virginia Beach–Norfolk–Newport News Metropolitan Statistical Area, a region with a population of about 1.7 million people. The metropolitan area is built around the body of water known as Hampton Roads, one of the world’s largest natural harbors. The Civil War naval battle between the USS Monitor and the CSS Virginia (formerly USS Merrimack), two iron-clad ships, took place in Hampton Roads on March 8–9, 1862, not far from where NNS is now located. The Port of Hampton Roads is the deepest and third-largest port on the East Coast of the United States (Norfolk Department of Development, n.d.). Using IMPLAN, Arena, Stough, and Trice (1996) estimated a personal income multiplier of 1.7 for spending at NNS. While that analysis is nearly 20 years old, no one we spoke to, either affiliated with NNS or not, felt that underlying conditions in the Hampton Roads region have changed markedly. NNS was and remains the largest private sector single-site employer in Virginia and a major economic engine of the Hampton Roads region. While the Hampton Roads region is home to other defense-related entities, including Langley Air Force Base, Norfolk Naval Air Station, and the Norfolk Naval Shipyard (NNSY), NNS seems to be largely disconnected from these other entities, with the possible exception of NNSY. These other defense-related entities’ existence in the region does not imply that it has the type of beneficial clustering that one might associate with, say, the Silicon Valley. Rather, these colocations may, in large part, reflect the desirable geographic location. NNS employs approximately 24,000 workers, drawn from a wide area. An NNS expert estimated that on the order of 1,000 employees live in North Carolina, driving more than 40 miles to NNS. Consistent with this observation, Table 1 presents U.S. Census 2011 data on where individuals whose primary job was in the private sector in Newport News lived. Of course, NNS is by a wide margin the largest private sector employer in Newport News, representing about 30 percent of the city’s private sector employment. NNS is an “employer of choice” in its region. NNS pays its employees well and has only limited attrition (estimated at 3–5 percent annually). NNS job openings elicit a large number of applicants. The only other employer in the region that is comparable in terms of size and skill requirements is the U.S. Navy’s NNSY, located in Portsmouth, Virginia. The NNSY employs about 9,500 workers (McCabe, 2014). The NNSY, one of the United States’ four naval shipyards, is tasked with the maintenance, repair, modernization, inactivation, and disposal of U.S. Navy ships and systems. Currently, the NNSY primarily services nuclear aircraft carriers and nuclear submarines (see Naval Sea Systems Command, 2012). NNSY does not build ships. Also, NNSY workers are employees of the U.S. government, whereas NNS is a private firm. The NNSY has not engaged in large-scale hiring in recent years, though it has plans for ramped up hiring in 2015 (McCabe, 2014). For white-collar workers (NNS uses the vernacular nonproduction), NNS recruits information technology, computer science, and engineering graduates from around the country. Much more so than for blue-collar (production) workers, experts told us that many of these white-collar workers probably would not be living in the Hampton Roads region were it not for NNS; they would work and live elsewhere. NNS also recruits extensively among former members of the U.S. military, for both production and nonproduction positions. Echoing a point we have heard at other shipbuilders, NNS has not hired many workers who previously worked at other U.S. Navy–funded shipbuilders. Rather, both in the context of NNS and other shipbuilders, we were told that shipbuilder workers are generally highly attached to their localities and reluctant to relocate (though willing to incur sizeable daily driving commutes). NNS has not had a trades-based layoff since 1999. However, NNS experts estimate that they could rehire half of laid-off employees one year later, if they so desired. Subject-matter experts in other shipbuilder regions suggested an even greater ability to rehire laid-off employees. Shipbuilder jobs tend to be considerably more desirable than most workers’ next-best alternative, especially in light of most workers’ reluctance to relocate. As mentioned, NNS has had limited attrition. As a result, while we heard anecdotes of NNS alumni (in several cases, retirees) setting up their own businesses, these anecdotes appear to be exceptions. We likewise heard an anecdote of a few workers who relocated from NNS to the Marinette Marine Corporation in Wisconsin, but the story was salient to the expert who relayed it exactly because of its unusual nature. A broader concern raised by Koch (2014, slide 54) is that the Hampton Roads region lacks a heritage of entrepreneurial behavior (e.g., start-ups, spin-offs). In recent years, the region has ranked last among Virginia regions in per capita new business start-ups (see Bozick, 2014). The area immediately proximate to NNS is not economically vibrant—for example, there are a number of boarded-up buildings, a lack of busy businesses, and a nearly complete absence of pedestrians in the middle of the day. Experts told us that NNS workers rush to their cars at the end of their daily shift (3:30 p.m.) and leave the vicinity as expeditiously as possible. Indeed, fee-based parking lots for NNS workers appear to be a major usage of property near the shipbuilder. Austal USA is the American branch of the Australia-based shipbuilder Austal. Its 165-acre site, opened in 1999, is located on Blakeley Island and adjoining Pinto Island in Mobile, Alabama. When the facility opened, it produced commercial ships (including two ships for the now-defunct Hawaii Superferry). These ships leveraged Australian Austal technology in building aluminum high-speed ferries using a catamaran design. Since 2009, Austal USA has shifted to solely designing and building U.S. Navy vessels; it has contracts for ten Joint High Speed Vessels (JHSVs), of which four have been delivered, and 12 Littoral Combat Ships (LCSs), of which two have been delivered. 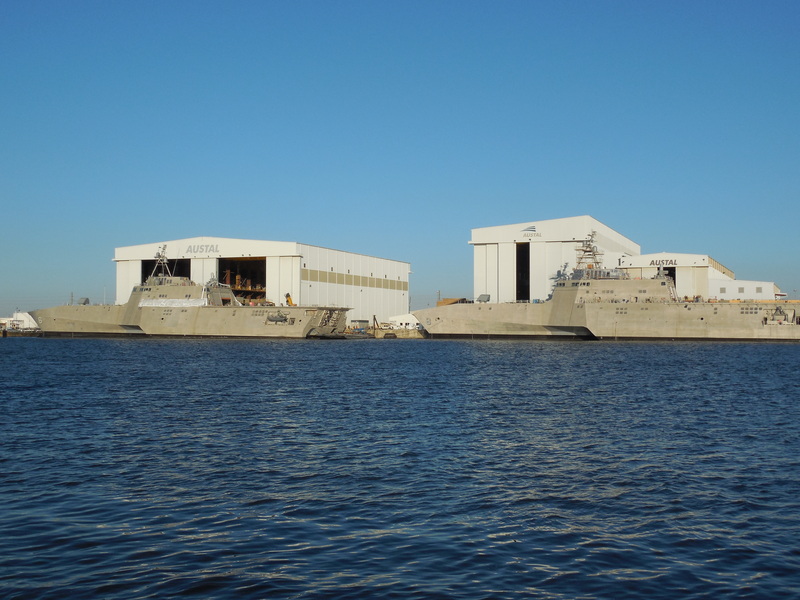 Austal USA’s experiences with the two aluminum ferries clearly helped the firm win the JHSV and LCS contracts. Austal annual reports show that Austal USA’s scale of operation has escalated considerably, with revenue increasing by nearly a factor of five between 2009 and 2014. However, even at its 2014 revenue level, Austal USA’s operations are considerably smaller than NNS’s (about $800 million in Austal USA revenue versus roughly $3 billion in annual contractual obligations for NNS). Likewise, Austal’s current employment level of about 4,200, while markedly increased from about 800 in late 2009, is well below NNS’s roughly 24,000. 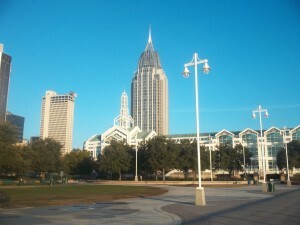 Mobile, Alabama, is a city on the Gulf of Mexico with an estimated population of about 195,000 for 2013 (U.S. Census Bureau, 2014b). The broader Mobile metropolitan area has an estimated population of about 415,000 (U.S. Census Bureau, 2014a). 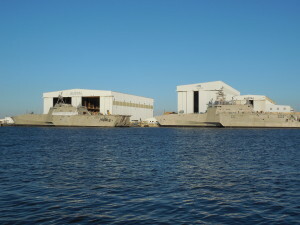 Austal USA’s facility is located immediately to the east of downtown Mobile. The Mobile River separates the Austal facility from the downtown area; there are two tunnels and a bridge connecting the islands to the mainland. To the east of Austal is Mobile Bay, which is connected by two bridges to Baldwin County, Alabama. Austal USA’s shipyard is very proximate to downtown Mobile, but they are separated by the Mobile River. Earlier, we noted our concern with the economically challenged area adjacent to NNS. Austal USA’s geography averts this problem to a considerable extent. There is no housing on Blakeley Island or Pinto Island; the islands are used for industrial purposes, as well as hosting the USS Alabama Memorial Park, which is east of the Austal facility on Blakeley Island. 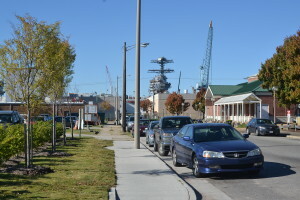 The Ingalls shipyard in nearby Pascagoula, Mississippi, has a similar arrangement, with the shipbuilding industrial area separated by water from other economic activity and housing. Such an arrangement appears to be preferable to NNS, which abuts the city of Newport News. It is difficult for a retail business that requires access for customers in automobiles to operate adjacent to a shipbuilder, given the shipbuilder’s surge of traffic in and out at shift changes. Likewise, it could be unpleasant, due to noise, odors, and traffic, to live next to such an industrial facility. Separation by water mitigates these issues. Chang (2013) presents data on where Austal USA employees live (see Table 2). Not surprisingly, most live in Mobile County or Baldwin County, east across the bay. But there are also a sizeable number from Mississippi (Pascagoula, Mississippi, is roughly a 45-minute drive to the southwest of Mobile), as well as some workers who live in the panhandle region of Florida (Pensacola, Florida, is roughly an hour drive to the southeast of Mobile). Reflecting the fact that shipbuilder jobs are both unique and relatively well paying, we have consistently, across all the shipbuilders we have examined, found a willingness on the part of shipbuilder employees to undertake sizeable driving commutes. In light of its ramp-up in hiring, Austal USA has considerable recent experience with accession pathways. (A billboard on Interstate 10 notes that Austal is hiring.) While Austal USA has hired some workers with prior shipbuilding experience (e.g., from Ingalls in Pascagoula), even those with prior experience needed considerable training, since Austal ships are aluminum and require aluminum-welding rather than steel-welding expertise. Indeed, most new Austal hires, we were told, lacked any shipbuilding experience. Many lacked any experience in an industrial setting. To obtain required workforce training for production employees, Austal USA has relied on a State of Alabama–funded Maritime Training Center. This facility is located immediately adjacent to the Austal property. The State of Alabama provides an Austal-designed six-week pre-employment training course to qualified individuals who aspire to work for Austal USA. We were told that Austal USA has ultimately chosen to hire about 60 percent of these trainees. One Austal expert described this state-funded training period as “basically a six-week job interview.” Additionally, Austal uses the Maritime Training Center to provide posthiring training and certifications to its new hires. Perhaps reflecting Austal USA’s newness in the local labor market, Austal has experienced considerable annual turnover. We were told that Austal USA has averaged 20-percent annual attrition (that it hopes to reduce to about 15 percent). Between the roughly 40 percent of state-trained individuals at the Maritime Training Center who are not hired by Austal and individuals who leave Austal employment, Austal has had the effect of considerably altering the workforce-skill profile in the greater Mobile area beyond its current employees. There is some evidence of an “Austal effect” in Mobile-area economic data. Figure 1 shows U.S. Department of Labor, Bureau of Labor Statistics, data on the change in Mobile manufacturing employment since September 2009. We also inserted a line based on the fact that Austal USA told us that its net employment has grown by about 3,400 workers (from about 800 to about 4,200) since late 2009. Austal’s employment growth appears to represent a considerable majority of Mobile manufacturing employment growth since late 2009. 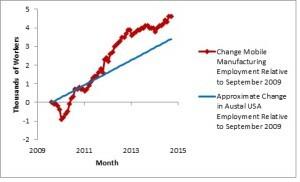 However, the fact that Mobile’s manufacturing growth since late 2009 has exceeded Austal’s growth (the red series over the blue line) suggests that Austal’s employment growth has not displaced other manufacturing in the region. As of November 2014, Airbus was constructing an A320 aircraft final assembly line in Mobile at the Brookley Aeroplex, about 6 miles to the southwest of the Austal facility. This assembly line is scheduled to open in 2015 and employ around 1,000 people (see Dugan, 2013). Austal USA has made purchases from local suppliers, but Austal USA’s presence has not (at least yet) caused the development of a cluster of nearby suppliers. The regional economic development experts we interviewed contrasted Austal’s effects with those of automobile manufacturers (Mercedes-Benz, Honda, Hyundai) in central Alabama (see Amazing Alabama, 2014). The presence of automobile manufacturers in Alabama, we were told, has caused their various suppliers to build plants near the manufacturers’ facilities. A straightforward explanation for this phenomenon in the automobile industry is volume: A car manufacturer building hundreds of thousands of vehicles per year needs a commensurable number of seats, headlights, doors, and other parts from suppliers. It is highly advantageous for those suppliers to be located proximate to the automobile manufacturing plant. By contrast, Austal USA produces a few ships per year. Lacking numerical volume, there is no huge logistical advantage for a supplier to be located near the shipbuilder. Chang’s analysis confirms that a large majority (in dollar-value terms) of Austal USA’s purchases are from suppliers located outside of Alabama. As mentioned, Arena, Stough, and Trice (1996) estimated a personal income multiplier of 1.7 for spending at NNS. We do not think that NNS’s economic impact is greater than 1.7 times NNS contracts’ values because of the paucity of spinoffs and spillovers in the Hampton Roads region. The spillovers/synergies possibility of a greater-than-estimated impact appears not to hold. It could, however, be that NNS’s impact is less than 1.7 times NNS contracts’ values. Subject-matter experts suggested that the shipbuilder’s white collar workers might alternatively work elsewhere in the country in comparable jobs. In that case, nationwide economic activity would be comparable with or without NNS, albeit with a redistribution from Hampton Roads to other regions. However, blue collar workers appear to be more geographically immobile so, for them, gains from NNS are real and, perhaps, considerable. We did not find a comparable economic multiplier estimate for Austal USA, but we think, broadly speaking, that its impact has been similar to NNS’s. Austal USA has made its employees better off without evidence of displacement away from other firms in the region’s economy. At the same time, it has not had large favorable spillover effects. What would affected workers be doing absent the project? Might the project imbue workers with skills that could be useful to other employers or in setting up separate businesses? The most favorable prospective projects would employ workers who would otherwise be unemployed or underemployed, plus would result in growth in employment beyond the originating project . 1] Our full results are presented in Keating et al. (2015). Here we present a distillation of that larger report. We provide many more references in Keating et al. (2015). This paragraph draws on Huntington Ingalls Industries (2014) and Newport News Shipbuilding (n.d.). In Table 2, we present data about where Austal USA workers live that we can then juxtapose with the type of U.S. Census data presented in Table 1. The Austal data suggest that U.S. Census data underestimate shipbuilder workers’ commuting distances. We therefore view Table 1 as a lower bound on the residential dispersion of NNS’s workforce. Subsequent to the bankruptcy of Hawaii Superferry, the U.S. Navy ended up acquiring these ships. They are now the USNS Guam and the USNS Puerto Rico. See U.S. Department of Defense (2012). Ingalls’s water separation from the city of Pascagoula is relatively new. The original Ingalls shipyard on the east bank of the Pascagoula River was adjacent to the city and its housing. Today, Ingalls’s operations are solely on the west bank of the river, separated from inhabited areas. Chang’s Austal data also provide us with an opportunity to assess the applicability of Table 1’s U.S. Census Bureau approach to shipbuilder workers (2013). 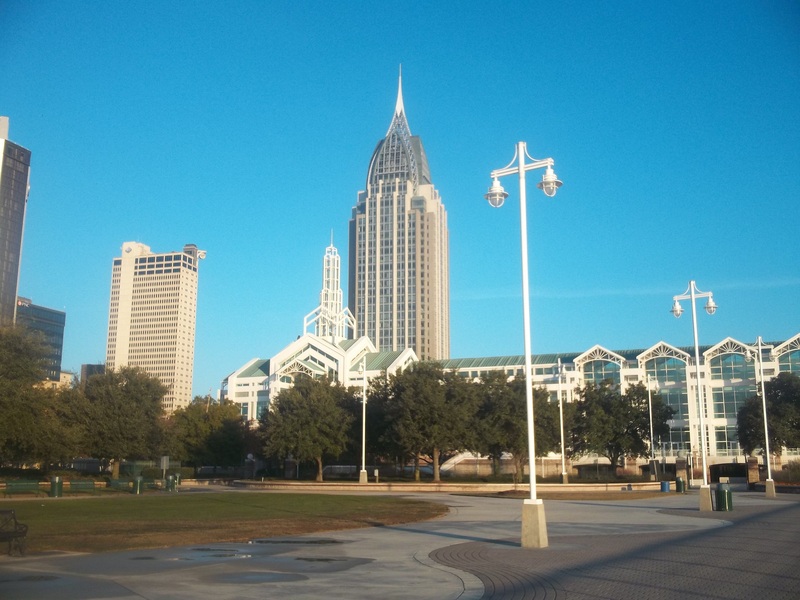 According to 2011 U.S. Census Bureau data, 71.8 percent of private sector employees in the city of Mobile lived in Mobile County, with 11.9 percent living in Baldwin County, 11.9 percent living elsewhere in Alabama, 2.1 percent in Mississippi, and 1.3 percent in Florida. Shipbuilder employees are more geographically dispersed than the average private sector worker. The authors appreciate assistance from editor Ron Coan and from Glenn Alcock, Sarah Bana, John Birkler, James Black, Semoon Chang, Charles Colgan, Rebecca Fowler, James Hosek, Dan Jenkins, Edward M. Keating, Krishna Kumar, David Lambert, Jonathan Morgan, Deborah Peetz, William Pfister, and Benjamin Zycher. This research was sponsored by, but does not represent the views of, the Australian Department of Defence. Of course, remaining errors are the authors’ responsibility. Arena, Peter M., Roger R. Stough, and Mark Trice, The Contribution of Newport News Shipbuilding to the Virginia Economy: 1996 with Forecasts to 2020, Arlington, Va.: Center for Regional Analysis, George Mason University, 1996. Chang, Semoon, “Austal USA: Economic Impact on the Coastal Counties of Alabama,” Gulf Coast Center for Impact Studies, April 24, 2013. Herman, Arthur, Freedom’s Forge: How American Business Produced Victory in World War II, New York: Random Home, 2012. Koch, James, “The State of the Region: Hampton Roads 2014,” briefing slides, Norfolk, Virginia, October 7, 2014. You mention RIMS and IMPLAN, any discussion of REMI, which incorporates not just input-output, but also econometric, cge and new economic geography methodologies? Thanks for reading our report, Mr. Young. Very good question about REMI. In theory, REMI could address some of our concerns. In particular, REMI makes allowance for elasticity, e.g., a new employer displaces employees from an existing employer so local employment doesn’t rise by the full amount of the new employer’s employment level. Our concern with REMI is that we’re not sure how to appropriately calibrate it. What is the appropriate elasticity coefficient for a specific location and context? I don’t think it’s REMI, per se, but we’ve seen some “computable general equilibrium” models that essentially assume full employment. Not surprisingly, a model like that will axiomatically suggest little-to-no impact of a new employer. We would argue that that is not a result; it’s rather a reflection of the model’s input parameters. In this spirit, how one parameterizes or calibrates REMI will go a long way to determining what the model tells one.